The Technology Access Clinic (TAC) serves children and adults with neurological, developmental and/or multiple disabilities. Our mission is to facilitate the communication of individuals who are not able to write due to a long-term physical disability and/or whose speech does not meet all of their communication needs. 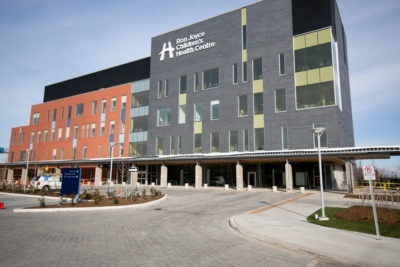 TAC is an Augmentative and Alternative Communication Clinic (AAC) which serves all of Hamilton-Wentworth, Brant, and Haldimand-Norfolk regions. TAC is approved by the Assistive Devices Program (ADP) of the Ministry of Health and Long Term Care to prescribe communication devices for individuals who cannot use speech for face-to-face communication or hand writing for written communication. Our team offers assessment, treatment, and consultation services. Assessment is typically done in the clinic, but follow-up consultations are done in the client home, school or community placement. Clients are often followed long term over many years as their communication needs change. capacity-building through a team approach, which provides clinical expertise and resources needed to attain the best communication and writing solution for our clients. During our assessment process, we determine a client’s eligibility to receive ADP funding for the lease or purchase of a communication aid or writing system. The most appropriate system for the client and family is prescribed to meet personal communication needs in the home. Individuals with a primary diagnosis of Learning Disability are not eligible for ADP funding. ADP, funded by the Ministry of Health and Long Term Care, provides financial assistance to Ontario residents with long-term physical disabilities to obtain basic, competitively priced, personalized assistive devices to give them increased independence and control over their lives. For example: wheelchairs, hearing aids, orthotics, and AAC systems (Communication Aids). ADP provides up to 75% (up to a maximum allowable amount) of the purchase price of ADP eligible face-to-face or written communication aids, depending on which ADP eligibility criteria you or your child meet. Families are also responsible for Harmonized Sales Tax (HST), and/or shipping and handling fees. Some clients are eligible to lease equipment through ADP. Your AAC clinicians will help you determine if you qualify for this option. ADP will cover 95% of the annual leasing cost. Families are responsible to pay the remainder, and associated HST costs. The maximum a family will be charged is $1000. Additional Funding: Additional financial assistance may be available through third-party funding sources, such as other community agencies, insurance benefits or local service clubs. Your TAC clinician can provide documentation needed for the application. Anyone can! However, a physician’s signature is required to confirm the client’s diagnosis. Live in the Hamilton-Wentworth region and surrounding areas. Have a valid Ontario Health Card number. Download or print a referral form here: TAC Referral Form. Contact us for a hard copy: (905) 521-2100 ext 77833. Please read important instructions on the Cover Page before completing the form. Mail or fax the completed form to the clinic (address and fax number are on the referral form). It is recommended that you make a copy before mailing us the original. You will receive a letter acknowledging that we have received your referral. The client will be placed on our waitlist. Please contact us if you do not receive this confirmation letter. To book an appointment, please contact your treating therapist. To change an existing appointment please call 905 521-2100 ext 44446.